Matthew Simunovic is an ophthalmic surgeon with subspecialty training in the surgical and medical management of disorders of the retina and vitreous. His clinical training was undertaken in Australia, North America and the United Kingdom. 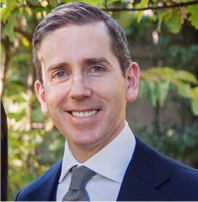 He is a Fellow of the Royal Australian and New Zealand College of Ophthalmologists (FRANZCO) and is a vitreoretinal surgeon at Sydney Eye Hospital. He holds honorary academic appointments at the University of Oxford and the University of Sydney. Matthew attended medical school at the University of Cambridge (MB BCHIR with distinction in medicine & surgery), where he also gained his PHD (for a thesis entitled The cone dystrophies). During his time at Cambridge, he was awarded the Duke-Elder Examination Prize and the Patrick-Trevor Roper Award by the Royal College of Ophthalmologists, London. He completed specialist ophthalmic surgical training at Sydney Eye Hospital and undertook subspecialty fellowship training in vitreoretinal surgery at the University of British Columbia, Vancouver and in medical retina at Moorfields Eye Hospital, London. He subsequently completed a combined clinical and clinical research fellowship in vitreoretinal surgery at the John Radcliffe Hospital/Nuffield Laboratory of Ophthalmology, University of Oxford. Here, in addition to his clinical duties, Matthew worked as part of a team investigating gene therapy for choroideremia and was part of the surgical team implanting the next generation of alpha AMS sub-retinal electronic implants. He was supported during his fellowship training by the Norman Rose Travelling Scholarship, the Sydney Eye Hospital Alumni Association Travelling Fellowship, the RANZCO/Bayer Australia Scholarship, the RANZCO/Novartis Medical Retina Fellowship Award and the Bayer Global Ophthalmology Awards Program Fellowship. Matthew’s clinical practice focuses on vitreoretinal surgery (including small gauge vitrectomy, scleral buckling and macular surgery), medical retinal disorders and complex cataract surgery in which vitreoretinal intervention may be required (including sutured and sutureless scleral fixation techniques for intraocular lenses). In addition to caring for patients, he is actively engaged in research and in the training of retinal fellows, ophthalmology registrars and medical students.